Stretching from the eastern slopes of the Sierra Nevada in California all the way to the Wasatch front of the Rocky Mountains in Utah and from the edge of the Mojave Desert and the Colorado Plateau in the south to the Snake River Plain of Idaho and the Harney Basin of Oregon in the north, the Great Basin comprises a huge expanse of the American West. While it is vast enough to encompass a variety of landscapes and habitats from alpine peaks low-lying desert, the Great Basin is generally signified by high, arid sagebrush desert cut by mountain ranges. 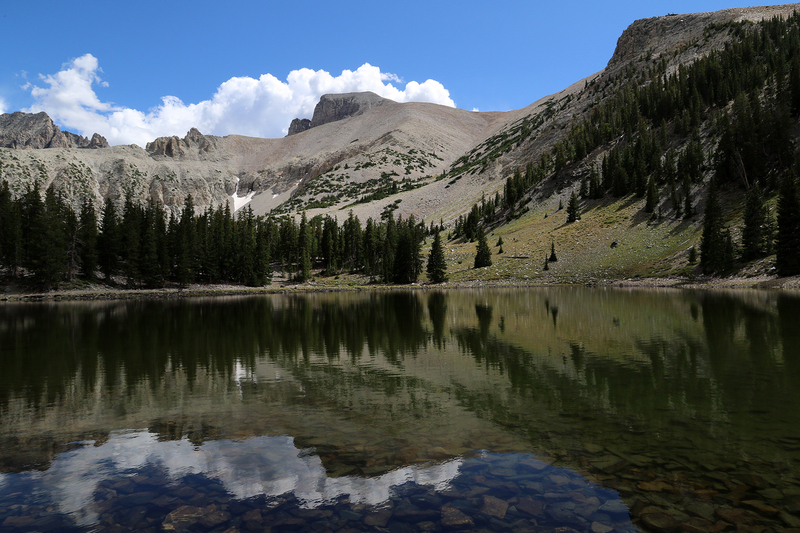 The Great Basin boasts 160 north-south trending mountain ranges separating ninety valleys. One of those mountain ranges is the Snake Range in eastern Nevada near the Utah border, which separates Snake Valley (elevation: 5,300 feet) in the east from Spring Valley (elevation: 6,400 feet) in the west. The Snake Range is capped by Wheeler Peak at 13,065 feet, the second-highest peak in Nevada. In 1922, President Warren Harding established Lehman Caves National Monument to protect a magnificently decorated cave in the eastern slopes of the south Snake Range. For the succeeding sixty years, talk ebbed and flowed of creating a National Park in the Snake Range. Finally on October 27, 1986, Congress combined Lehman Caves National Monument with a portion of Humboldt-Toiyabe National Forest to create Great Basin National Park, 77,180 acres of sagebrush sea, Pinyon-Juniper woodland, conifer forest, sub-alpine and alpine mountain habitat, Lehman Caves, Lexington Arch, and Great Basin Bristlecone Pine woodlands. After our Park-filled 2016 and trip with my cousin Andrew to Death Valley National Park in February 2017, by early July 2017, Sean and I were itching to visit our next National Park. Over the Fourth of July weekend on a pontoon boat with friends and family on Lake Ripley, Wisconsin, we gave voice to our anxiousness for a Park. The perfect candidate to be our twenty-fourth National Park would be a one-off obscure enough to not be completely mobbed in July or August. That said, we had visited Shenandoah National Park on the final weekend of July 2016 and found solitude, so we knew it wasn’t just when you visited a National Park, but also how you spent your time that led to a good trip, but we still wanted to have some headspace. After looking for airfare and weekend options (and camping availabilities and such), three Parks rose to the top of the list: Acadia in Maine (obviously not a little-visited Park in summer, but a very attractive campsite was free for one of our possible weekends), Black Canyon of the Gunnison in Colorado, and Great Basin in Nevada. Truth be told, Great Basin National Park has long been on my most-excited-to-visit list (along with Lassen Volcanic, Guadalupe Mountains, and North Cascades). We were prepared to pull one randomly out of a hat. Great Basin was the choice, and we decided to go August 17-22, 2017, giving us four full days in the Park with partial travel days on either side. We looked forward to relatively ample time in a comparatively small Park. We booked flights in and out of Las Vegas, lodging in Henderson, Nevada for after we landed, and a Jeep. The Park campgrounds are first-come, first-served, so all we had to book in the Park itself was our tour of Lehman Caves, which we did for the morning of August 18, our first full day there. The desire for Great Basin had been recently fueled by our friend, Patrick, who had visited briefly to see the Bristlecone Pines on his drive back to Chicago from California in 2016. And two conservation colleagues of mine from Illinois, Edith and Tom Auchter, spent their summers volunteering at the Park and running the astronomy programs. Edith had whetted my appetite for the Park at a conference in January 2017. It wasn’t until we’d booked our trip that it occurred to us that we would be at Great Basin National Park for the solar eclipse of 2018. We would not be in the path of totality, but we’d be about the same distance from it as we’d have been had we stayed in Chicago (except south of the path, not north). We were completely satisfied with this happy situation. This entry was posted in Journey and tagged Great Basin, Nevada on January 21, 2018 by Brandon Hayes.